I’m so proud of myself for coming up with this sugar-free coconut milk ice cream recipe. I mean, I think it’s genius. You only need four ingredients – 4 frozen bananas, butter, coconut milk and pecans. Did you hear that? No sugar of any kind, other than what is naturally in a banana. It does take a little time to prep ahead of time because you have to freeze the bananas first. Although, really that’s what I do when all my bananas are starting to go bad. So it may not even be an extra step for you. I put brown frozen bananas in smoothies all the time. You may be tempted to skip the freezing the banana part, but don’t. When you freeze the banana, it changes the structure of it and when it’s blended, it is so creamy. Plus, the sweetness of an over-ripe banana makes it plenty sweet, at least for me. The riper your bananas are, the sweeter the ice cream will end up being. This happens to be a delicious way to use up any over-ripe bananas you have laying around the house. You may be tempted to brown all the bananas, but try to resist the temptation. The consistency won’t be as creamy and it will be icier and not as substantial. You can use an ice cream maker if you want. If you do, you don’t need to freeze the bananas. Just caramelize the bananas and through everything in the blender then put in your ice cream maker and follow the instructions for your ice cream maker. I don’t recommend you make a large batch and keep it in the freezer unless you want to just pour the extras into popsicle molds and have ice cream popsicles. If you try to freeze it to eat as ice cream later, it can freeze hard and be icy (like a popsicle). To avoid this, you could make it in an ice cream maker or let it sit out on the counter for a while to soften a bit before scooping. You use both the solid and the liquid from the canned coconut milk. You could always take this base ice cream recipe with the frozen bananas and coconut milk and change up the flavors, like peanut butter, chocolate chip, chocolate, peanut butter chocolate chip, berries, etc. Pretty much any kind of regular ice cream flavor, except something like cookies and cream or Oreo, would work well. If you don’t have a GOOD blender, it really helps with something like this. When I use my Vitamix, this ice cream is creamier and smoother and it doesn’t burn out the motor. After burning out the motor of a regular blender three times in a year, I bought a Vitamix blender. It’s lasted me for at least five years and I use it probably at least once a day. I’ve also heard good things about Blendtec blenders and I think they are both a good choice. You should be using canned coconut milk and not the coconut milk that is found in the refrigerated cartons. It will affect the creaminess and overall texture of the ice cream. I don’t know about you, but ice cream is by far my biggest weakness! I love it so much! I would not be the cookie monster but ice cream monster!!! Time to make this delicious Paleo banana nice cream recipe! I hope you enjoy this coconut milk ice cream recipe! Do you have any more tips to make this ice cream even better? Leave your feedback in the comments and let me know if you like the recipe and if you have any tips for the other readers. Only if you can find a good sugar free sorbet recipe. Sorbet is just water and sugar usually. Is there any Paleo ice cream? A paleo ice cream recipe that only has 4 ingredients. It is a healthy version of a classic dessert treat. It is creamy with caramelized bananas and pecans. Place the frozen bananas(both the caramelized and the un-caramelized)in a high-speed blender like a vitamix. A food processor would work, as well. These are 9 of the best ever Paleo ice cream recipes. I love Paleo ice cream because it is also dairy-free and surprisingly delicious. Anybody that really knows me, knows that ice cream is my favorite food. I love it in almost any flavor. 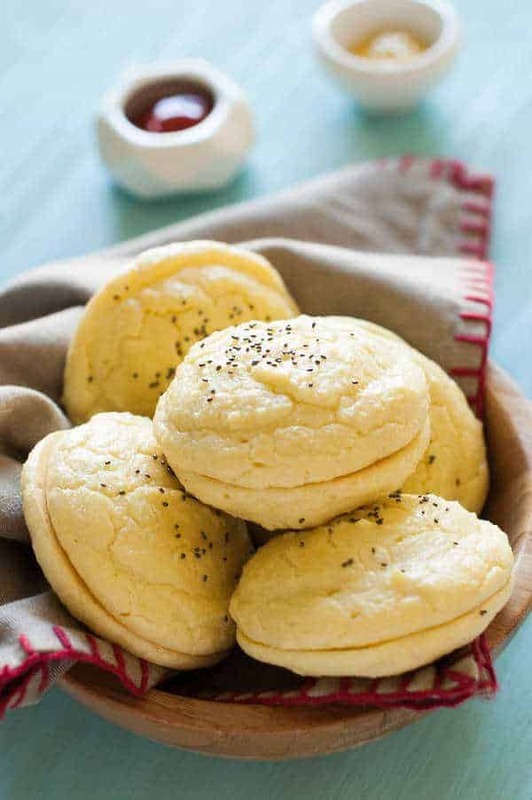 One of the reasons why I like Paleo recipes so much is because they are dairy-free. I am sensitive to dairy products so I try to avoid eating anything with dairy in it. I currently do not eat a strict paleo diet – I just like to incorporate Paleo meals and foods into my daily diet. But since I am sensitive to dairy, Paleo is a great way for me to go. If you haven’t tried any Paleo ice cream recipes yet, you may be surprised how rich and creamy other kinds of milk can be and you may not even miss regular ice cream. Ice cream is actually a really popular dessert here in Utah. Everyone I know and don’t know loves ice cream except for my mother. My mother never has liked ice cream very much. Come to find out, she is milk sensitive and she thinks that’s why she’s never liked it. Well, I have 9 answers for her, most of them made with coconut milk or coconut cream. Now, my Mom can enjoy ice cream and not have to worry about that yucky feeling she gets in her throat when she eats ice cream – and so can you. 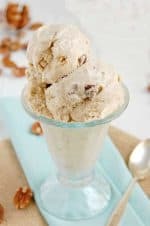 After reading over all these Paleo ice cream recipes, I decided that once you figure out a base, then it seems like it would be fairly easy to add whatever ingredients you want to make any flavor of that you desire. Although I have never tried this – so it may be harder to do than I am anticipating. I guess I will need to start experimenting! Let me know if I’m right – and how your luck is with these or other recipes! Enjoy! This is made with an egg yolk custard for a more creamy and less icy product. (My grandmother always made her homemade ice cream with an egg custard base) The peaches are roasted which makes the skins fall off easily. It is best made with fresh peaches from an orchard or a Farmer’s Market. Peaches you buy in the store are never ripe enough and just don’t taste the same. Don’t tell your kids it’s not really “ice cream”, they won’t know the difference. Debra’s didn’t know the difference. Actually, it’s just healthy ice cream sweetened with bananas and honey instead of tons of sugar. A large amount of vanilla is necessary, don’t skimp and the coconut oil is the key to the texture. It’s also healthy fat which is a good thing. Ice cream costs a fortune in the store plus you don’t know exactly what it’s made with. With homemade, you can make it with good wholesome ingredients. There is no added sugar here, it’s only sweetened with dates. An even bigger bonus is you can make up your own flavors. I think an ice cream maker is a good investment because it will pay for itself after only a few batches. It’s cool how when you mix cashews and lemon that it tastes similar to cheesecake. This is pretty creamy even if you keep it in the freezer for several days. The secret is to mix the eggs, the milk, and the arrowroot powder. The arrowroot powder keeps ice crystals from forming while it’s in the freezer. This is creamy vanilla ice cream with a rich homemade hot fudge sauce and chopped almonds. There is a link to the hot fudge, so make sure you don’t miss it. This is so much more healthy and a whole lot cheaper than buying ice cream in the store. My family loves it and we could eat a whole store out if we tried. But we won’t, we’re going to make our own. Does anyone out there remember those cherry chocolates at Christmas time? Probably not. My grandma received them as gifts every Christmas season. I remember she didn’t like them and grandpa didn’t love them. So I always ate them for them. They could only be eaten one way. By putting the whole thing in my mouth at once. If you took a bite of it you ended up with the runny gooey center all over the place. This reminds me of them. The flavor of cherries and chocolate together is wonderful. It just the center of the chocolates no one liked. Pitting cherries isn’t a very fun task but a cherry pitting tool can be helpful. This is my favorite ice cream maker, it pays for itself after just a few uses. Amazing! Just made this tonight in my vitamix. So creamy and delicious! Have you tried this with other fruits instead of banana? Maybe peaches? Or berries? I haven’t tried but I’m 99% sure it wouldn’t work with other fruits. There is something special about the bananas that works and it just wouldn’t work with other fruits. This ice-cream was quite yummy however, mine certainly did not look like the one in the picture. Also DO NOT RE-FREEZE after blending it. It doesn’t taste anything like it does before you re-freeze it. Thanks for the tips. Right. Leftovers of this do not work. This is really tasty! Thank you! I’m glad you like it. Thanks for commenting. I’m salivating. I’m going to make this tomorrow! I wanted mine to taste a bit more like a butter pecan. Four bananas made it a bit too sweet. I used two caramelized bananas, a full can of coconut milk, a dadh of salt and added two tablespoons of maple syrup. Perfection. Thanks for the tip. Hopefully it will help others! I have just fried up 4 bananas for 2 lots of this ice-cream because it was SO SO good the first time. We are also reducing sugar and have tried various fruit ice-creams and frozen yoghurts but this is the best. My partner declared this was better than ice-cream giving it a score of 10.5 out of 10! Thanks for the delicious recipe. This recipe was amazing. My family is trying to cut way back on eating so much sugar, but to keep everyone on track, we need to occasionally have a sweet treat. If all 3 of us sugar lovers liked this, it has this be good! We did pop it back in the freezer for about an hour and then scoop it out with an ice cream scoop. This is most definitely a keeper! Hi! The ingredients say 1/2 cup chilled coconut milk. Is it just the fat at the top or should we shake can for the entire milk when measuring? Thanks! You chill it so it’s cold, not necessarily to get the fat off the top, although that’s what I usually do, just because it’s creamier and thicker. You are my new best friend because of this recipe. Yum! Ha ha! I’m glad you like it. I’m pretty proud of it myself. I am two weeks into the Paleo diet and was having a serious craving for something sweet. I had tried the frozen banana ice cream recipe on another site and it was “ok” but not quite the sweet I was craving. Browning the bananas was the trick! This was perfectly sweet and very satisfying. My mom, sisters and I are having a crafting weekend soon and this will definitely be served to show them that I still eat the “good” stuff, now it’s just good for me too! I am glad the recipe worked well for you! Keep it going! You got this! It sounds like some people are using coconut milk out of the carton and the sweet coconut milk oot of a can which is it? I use it from the can because it’s much creamier and has the fat you need to actually make an ice cream. I’ve never tried it from a carton though because they don’t have that at any stores around here, so maybe it would be fine. This sounds fantastic! I can’t wait to give it a try. Do you think ghee would substitute the butter well? I’m trying to avoid butter too! It will change the flavor of the ice cream so perhaps give it a try and see if it is what you are looking for. Let us know how it works out if you choose to do so. Your welcome! Glad you like it! Thank you so much for sharing this recipe with us. I have a sweet tooth (like you wouldn’t believe) and ever since my daughter was born (17 months ago)I’m doing everything in my power to cut my chocolates and sugar so we all getting only the good stuff. I couldnt find a homemade icecream recipe that would be satisfying and healthy of course but this is by far the best I have ever made! I am not on paleo diet but my cooking is based on very similar principles and I think it’s the best approach. You are welcome! I am glad it works well for you! This recipe sounds really great! Too bad my blender gave up the ghost after 17 LOYAL years a few days ago. 🙁 Once I get my new one, I’ll have to break it in with this recipe!! Can’t wait to try it!!! I am sooo going to be trying this recipe, tried something similar but not with caramelized bananas or nuts. I have made this recipe twice. It was delicious. I have to get more bananas to make it again. I’m getting a craving. Thanks for the recipe. Thanks for the comment! We would love to help you try more of our recipes. Tried this recipe a few days ago and it is fabulous! Very satisfying. Thank you for sharing! I couldn’t get it done today, but hopefully tomorrow. It’s all ready to go but other things got in the way. One thing about the banana ice cream is that even though there’s no added sugar, people need to remember bananas are very high in sugar. Those who are insulin resistant need to be very cautious about consuming too much fructose. I’ll be fixing this today ( between gardening chores 😉 I make several ice cream flavors with the coconut milk and bananas, and did do one butter pecan type, but this sounds great with caramelizing the bananas. I know my dear husband will be thrilled. Thanks! My mother’s lactose intolerant, what could I use instead of butter. You could use a non-dairy or vegan butter, your local health food store should have them. Do keep in mind that it may not brown the same as a regular butter. This says serve straight away but is it ok to keep it in the freezer and just scoop out like regular ice cream? The ice cream has the best texture if served right away with it’s soft serve consistency. You can keep it frozen, but it will be difficult to scoop out when solid. Let it sit on the counter for awhile before trying to scoop. You could also avoid the hard freeze by making the ice cream in an ice cream maker. If using an ice cream maker is all the freezing and chilling of ingredients the night before still necessary? I love ice cream but not all that sugar. Thanks for this great recipe. I will definitely will try this.I have a vitamix and it really works well.I make a ice cream with frozen bananas and peanut butter, It is very good and it gives you the protein we need. This looks amazingly good and I can’t wait to try it! Mine turned out more like a smoothie but still very delicious! Do you use the solid or liquid from the coconut milk (or both). Rebecca, this ice cream looks seriously amazing and I’m in love with the flavors! I totally have to try this! Thank you so much for sharing at Best of the Weekend and pinning. Hope you’re having a wonderful week! Could you make a large batch and keep in the freezer? Sounds yummy! You could, but it would freeze pretty hard and have a bit of an icy quality. To avoid this, you could make it in an ice cream maker, if you have one. If not, let it sit out on the counter for awhile to soften a bit before scooping. This looks so amazing. Trying soon. pinned. found at showstopper sat. Have a great weekend. Yum! This sounds so good. Pinning to try! Do you think I could blend everything together and use my ice cream maker? This is an amazing recipe! Oh, this looks fabulous! 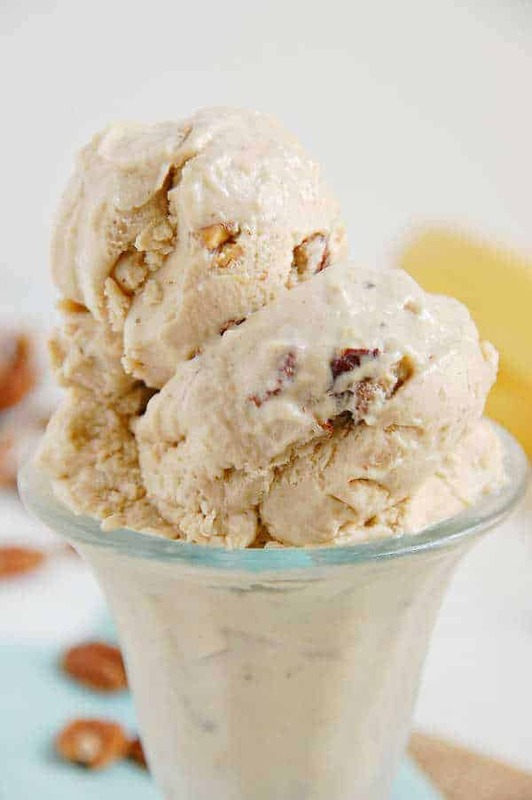 i love making banana ice cream but haven’t added pecans to the mix. Sounds amazing! Just tried this and it was definitely very good, but perhaps it might be even better if I were to brown ALL of the bananas instead of half of them? That really seems to bring out the banana flavor. Thoughts? You can brown all of the bananas if you like, but the consistency will not be quite as creamy and a bit more ‘icy’. The bananas that are not caramelized keep the ice cream creamy as well as keeping it substantial. I think this looks great, I will try it! I always have frozen bananas in the freezer! We would love to hear how it turns out!